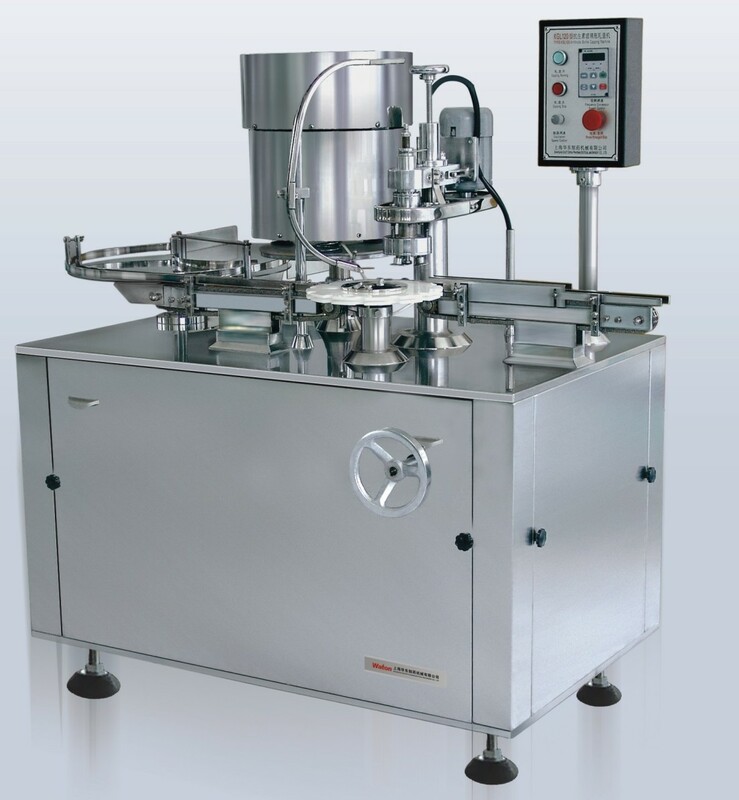 KGL roller type capping machine is typical equipment for product of antibiotics vial and freeze drying. The main working principle is to adopting 3-knife flexible roller capping. The capping head starts from the top of the bottle neck, and then press the Alu cap from shallow to deep, so the Alu cap can seal the bottle neck firmly. It can assure that the Alu caps are auto-fed, auto-added and auto-capped. Its main structure consists of bottle feeding and exiting mechanism, capping mechanism cap oscillator, bottle conveyor, graduator and transmission parts. 1) Bottle Feeding and exiting mechanism: It consists of bottle feeding turn table and bottle exiting conveyor. The bottles are buffered and fed into turn wheel for capping, after capping; are delivered to the bottle conveyor. 2) Capping head: The capping mechanism is like this: the 3-knife covers the Alu caps and bottle neck, with the help of the reciprocator and the spring, the capping knife press the Alu caps to shape the cap screw likewise. And the capping procedure is finished. 3) Cap oscillator and track mechanism: By the vibrating of the oscillator, the caps are oriented and conveyed to the cap-adding part via cap track. 4) Graduator: adopting intermittent graduating device to reach the goal of intermittent cap-adding and capping. 5) Transmission mechanism inside the machine: By motor, gears, cams, chain and wheels, the electric power are transmitted to the working section. Meanwhile the motor is adjustable by inverter. Aluminum/plastic cap and aluminum cap could be used on the same machine.